Carl Thomas Keifer (born January 26, 1961, in Springfield, Pennsylvania) is an American vocalist and guitarist for the band Cinderella. Tom Keifer grew up in a musical family and began playing guitar at a young age. Keifer soon fell in love with the blues and was heavily influenced by this kind of music. Keifer joined his first rock band while in junior high school. He soon learned to play the electric guitar. The young musician struggled with drug and alcohol abuse in high school, and considered dropping out of school to pursue a music career. However, his mother Adrienne bribed her son to stay in school by promising him a Gibson Les Paul guitar upon graduation. Keifer graduated and received the coveted instrument. After graduating Keifer played guitar in bands such as Saints in Hell, Telapath, and Diamonds. Soon, Keifer conquered his addictions, and began to focus on a career as a musician. He had started writing original material. He also found financial support by walking race horses at tracks and delivering film to developing outlets. Keifer came closer to his dream of being a successful artist by forming the hard rock band, Cinderella with good friend and bassist Eric Brittingham, whom he met on Halloween night in 1980 in a bar bathroom, and also who had been in Saints in Hell. Despite being shy, Keifer took on the role of lead singer because they could not find anyone they liked to sing for the band. In articles, Keifer has said, "I don't feel comfortable when I'm up there singing and not playing guitar. I feel naked when it's just me and the microphone." Cinderella was discovered initially by Gene Simmons of Kiss who attempted to get the band signed to no avail. It was then Jon Bon Jovi in 1985, at the Empire Rock Club in Philadelphia, Pennsylvania, that convinced his Mercury A&R manager Derek Schulman to sign the band. Bon Jovi has been quoted as saying "I saw Tommy Keifer onstage delivering some pretty nifty, growling vocals. Then he whipped out this Les Paul and proceeded to lay into some astounding sounds. This guy struck me as a star right then and there." Keifer and company experienced much success with their albums, Night Songs, Long Cold Winter, and Heartbreak Station. Keifer enjoyed the reputation of being a prolific songwriter with hits such as "Shake Me", '"Nobody's Fool", "Gypsy Road", "Don't Know What You Got", "Coming Home", "Shelter Me", and "Heartbreak Station". He also enjoyed spending time with his wife, Emily, whom he had married in 1987 after years of dating. She also designed the band's unique logo and often accompanied her husband on tour. After the Heartbreak Station tour Keifer lost his voice. He underwent several operations to no avail. Eventually it was determined that he had paralysis of the left vocal cord. To make matters worse, his mother died of cancer. By 1994, Cinderella had managed to release their fourth album, Still Climbing, which received little attention. The band broke up in 1995. Keifer continued to undergo surgeries on his vocal cords. He also battled depression. He was forced to learn how to sing again because of the paralysis of his left cord, but he eventually began working on material for a solo album. He and Emily divorced, and he settled in Nashville, Tennessee, where he continued to work on his solo album. The album was put on hold after Cinderella reunited in 1997 and toured in 1998. They signed with Sony Music, but were dropped a few years later. They released a greatest hits album, Once upon a… and a live album, Live at the Key Club. Cinderella toured the United States in 2000 and again in 2002. Keifer has a daily regimen, including warm-ups and exercises, that may last longer than some of his shows; however, Keifer feels that he has his condition "under control." Cinderella was the headliner of the 2005 Rock Never Stops Tour. Keifer and Cinderella completed their 20th anniversary tour with fellow rock veterans Poison in 2006, who were also celebrating twenty years in the music business. The tour was a rousing success and swiftly became one of the most successful tours of 2006, averaging about 12,000 people in attendance per night. Keifer recently[when?] said that his solo album will be released shortly, and a new album from Cinderella is possible somewhere down the road, though not immediately. Cinderella had planned to tour in 2008 with Warrant, Lynch Mob, and Lynam. Unfortunately the tour had to be postponed after Keifer's left vocal cord hemorrhaged again, thereby making it impossible for him to sing in the immediate future. Keifer has recently worked with country artist Andy Griggs. He also appeared on an episode of Extreme Makeover, where he helped a fan write a song. Keifer has finished his solo album, which was released on April 30, 2013. As of May 2, 2013, Keifer has been touring his solo album The Way Life Goes, moving from California, to across the Midwest, culminating in Chicago. The tour also visited many countries, including Russia. On Sunday July 22, 2017 Keifer was an act featured in Loud-N-Lima's 3-Day Music Festival in Lima, Ohio fеaturing many artists for the hair metal era's peak. 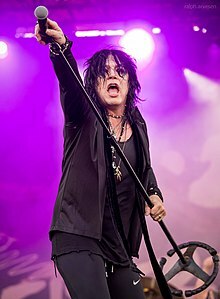 The most recent news from Tom Keifer on an interview last November 23, 2009 with Metalzone said they have never really gone away. They've been kind of on a break because he injured his voice a few years back and has been trying to rehabilitate his vocal cords and train it back to where he can be able to perform a Cinderella show again. "I thought that I was there in the summer of 2008 for the tour for the States here, and we ended up having to cancel that tour because I re-injured my voice. Since then I've been working on trying to get it strong again, which I am glad to say it's very strong now and we're looking to be back out on the road in 2010." When asked about his solo record, (as of April 2010) he said "It’s pretty much finished. I’m booking a mastering date, probably in May sometime, before we hit the road for the summer. Then I will be looking for a label for it". When asked about the possibility of a new Cinderella record, Tom said it is probable but the band would need to be all in for it, and the record label would need to be for it. In 2013, Keifer discussed the progress of his solo album, and was quoted saying the following: "The idea for a solo record started in the Nineties when the band parted ways and we left Universal," said the frontman. "There was just a changing of the guard in the industry at that time and I started thinking about a solo record. I wrote for it for many years and the songs just kept going on the pile and I never got around to actually making a record... We started cutting tracks for this record in 2003 and I went to the pile of songs that had been building up and picked some that I liked and I've just been working on it ever since. It was produced independently of a label, because the idea from the beginning was to just work and record until I was happy with it. I wrote with a lot of different people – my wife, Savannah, who's a great writer, co-wrote a lot of the songs on the record and also co-produced the record with me, and a good friend of ours, Chuck Turner, who's a great engineer and producer. So from the beginning, the attitude was, 'Let's have fun and just make a great record and it'll be done when it's done.' Little did we know it'd be nine years later... it's done and we went through some crazy stuff and mixed and remixed and reworked things over and over and probably made a lot of mistakes along the way, but finally got it where we were all happy with it, so here it is." Today, Keifer is married to singer-songwriter Savannah Snow. In February 2004, their first child, Jaidan, was born. ^ Rys, Richard. "Exit interview: Tom Keifer". www.phillymag.com. Retrieved 19 November 2017. ^ Ruhlmann, William. "Biography: Cinderella". Allmusic. Retrieved March 14, 2010. ^ Hudak, Joseph. "Cinderella's Tom Keifer Relocates to Nashville to Find a Rootsy, New Voice". www.rollingstone.com. Retrieved 18 November 2017. ^ Johnny Price (May 11, 2013). "INTERVIEW: TOM KEIFER'". RockRevolt Magazine™. ^ Alanna Conaway (Oct 28, 2013). "Andy Griggs Releases New Music to iTunes". Country Weekly. "Don't Know What You Got (Till It's Gone)"
This page was last edited on 27 March 2019, at 02:30 (UTC).